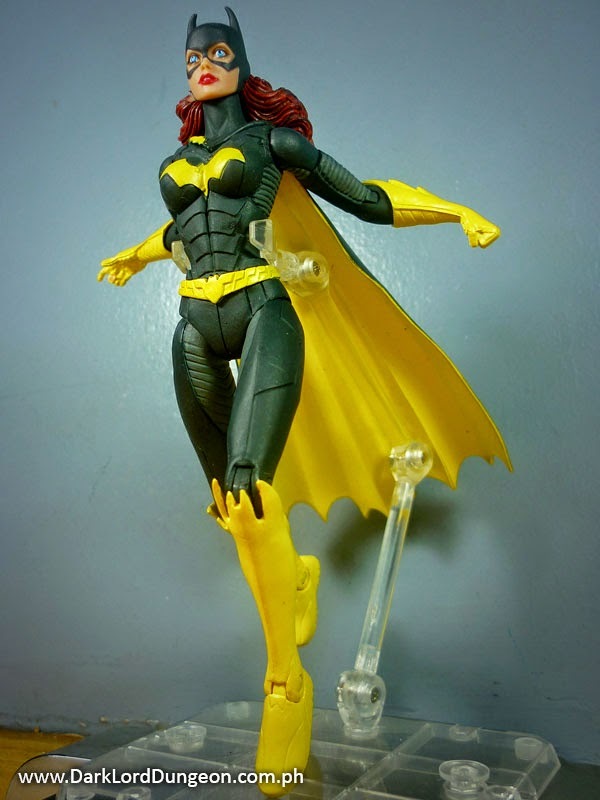 Presenting the New 52 Batgirl from DC Comics. We should enjoy her while we can because if the rumors about DC Convergence are true, then we might not see Barbara Gordon as Batgirl - or even walking - again for quite a while. Anyway, to the uninitiated, this is Barbara Gordon, Commissioner Jim Gordon's daughter, back as Batgirl in the New 52 Universe. In the New 52 Universe, the Killing Joke story-line that reduced Batgirl to a wheelchair where she became the near omniscient, cyber-bsed crime fighting database of knowledge and constant voice in the ear of Batman - and most of the Justice League: Oracle. 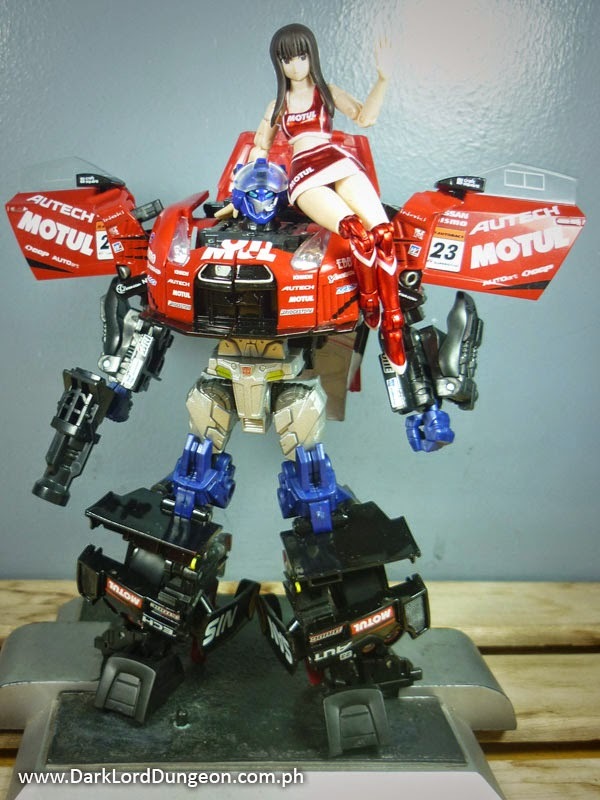 Presenting the Nissan Motul Autech GT-R Convoy - Optimus Prime from Takara with his Motul Autech "sister" Misaki. We don't want to say that he's a rebuild of the 2008 Takara Alternity Optimus Prime.We believe that to do so would be a great injustice to the designers of what we have here. This is a rebuild of the Takara Alternity Optimus Prime. We won't pretend to understand what the Alternity is - basically it's an alternate dimension that you can read about here. We feel that what the packaging has to say about the Takara GT-R Convoy or Optimus Prime is more important. Unfortunately it's mostly in Japanese - which we don't speak/read/write. 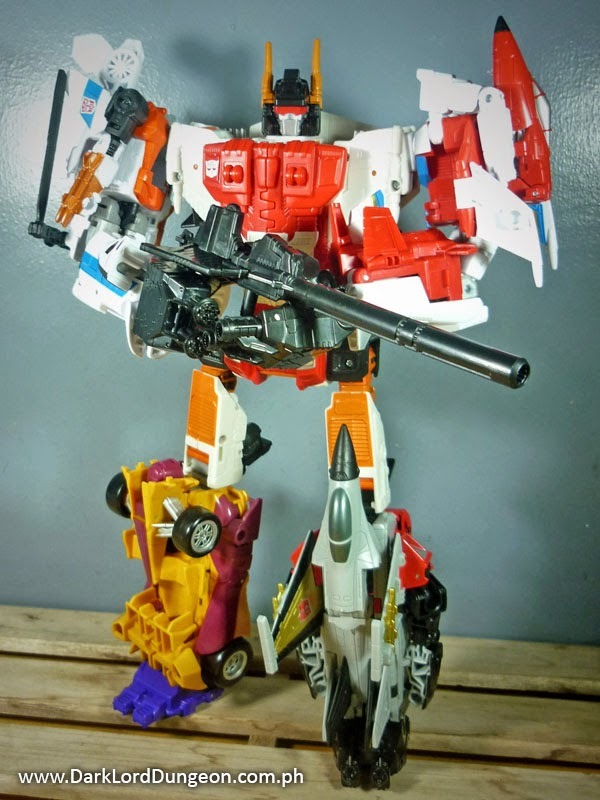 Presenting Superion from the Transformers Combiner Wars series. 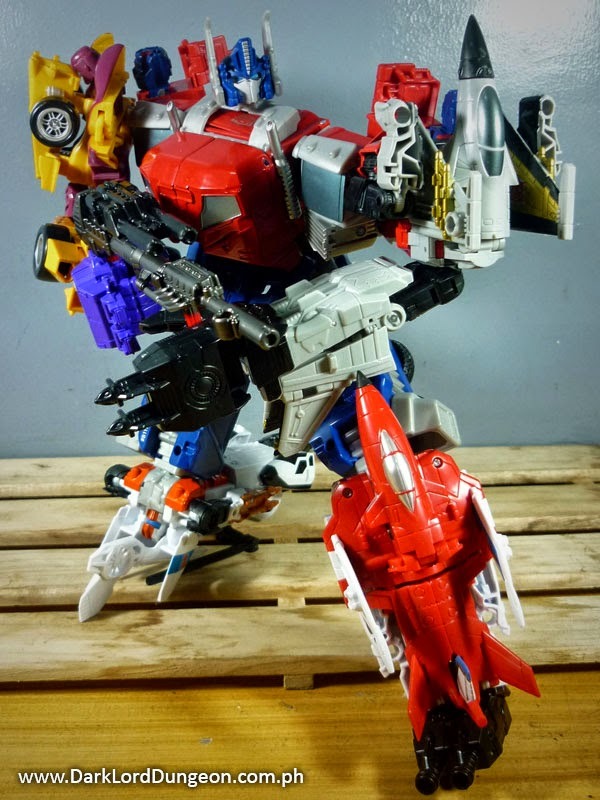 To be perfectly honest we really weren't planning on getting the Transformers Combiner Wars Silverbolt which would allow us to create the mighty Superion. But after having so much fun with the mega-mighty Ultra Prime, we had to check him out and see if Superion was just as much fun. To the uninitiated, this is Superion, the gestalt form of the Aerialbots. The Aerialbots were a group of Autobots cold constructed by the G1 Autobots as a response to the Decepticon Team, the Stunticons. They were intentionally created to all be flyers because the Decepticons always had air-superiority and because the Decepticons had created the Stunticons to be land vehicles. 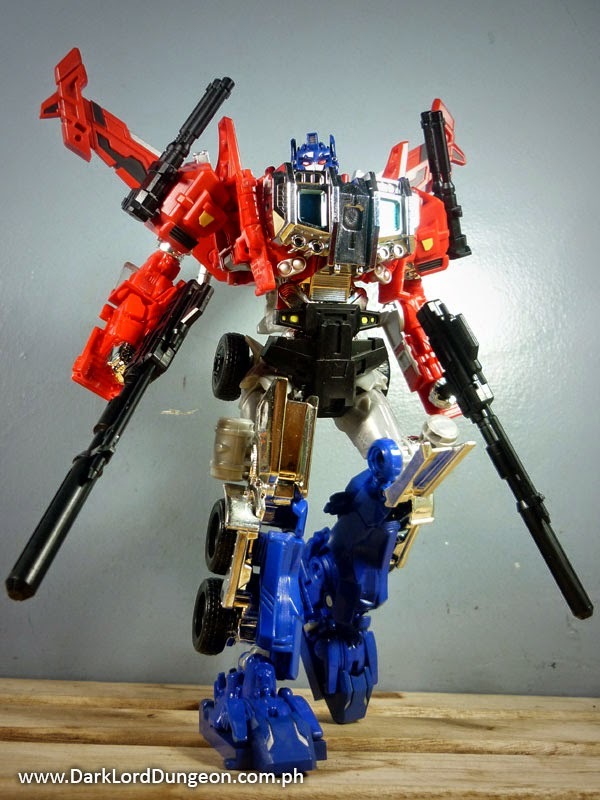 Presenting the Transformers Combiner Wars Optimus Prime. Well technically this is Ultra Prime: The Transformers Combiner Optimus Prime with the Aerialbots Alpha Bravo, Firefly and Skydive with the Decepticon Stunticon Dragstrip. Yes a Decepticon. Hasbro chose to release the series sans one Aerialbot and released a Stunticon instead. And being the suckers we are we just could not wait for the second wave of Combiners and bought Dragstrip instead just so we could have a complete set to review. Personally we're hoping that Hasbro or any other 3rd party group releases other combiners that are more.... robust. Perhaps a combiner team dedicates solely to Prime. Presenting the COBRA Arctic BAT (Battle Android Trooper) from the GI Joe Arctic Ambush 2-pack. In 2011 we featured the really wonderfully decked out COBRA Jungle BAT and we really loved the idea of a heavily armed soldier that just refuses to die no matter how many times you shoot him. And this is the Arctic version of the Jungle BAT. We picked up the GI Joe Arctic Ambush 2-pack precisely for the COBRA Arctic BAT - not that we didn't appreciate a reissued Snow-job, it's just that we already had one and this one didn't even have a bi-pod for his sniper-rifle. 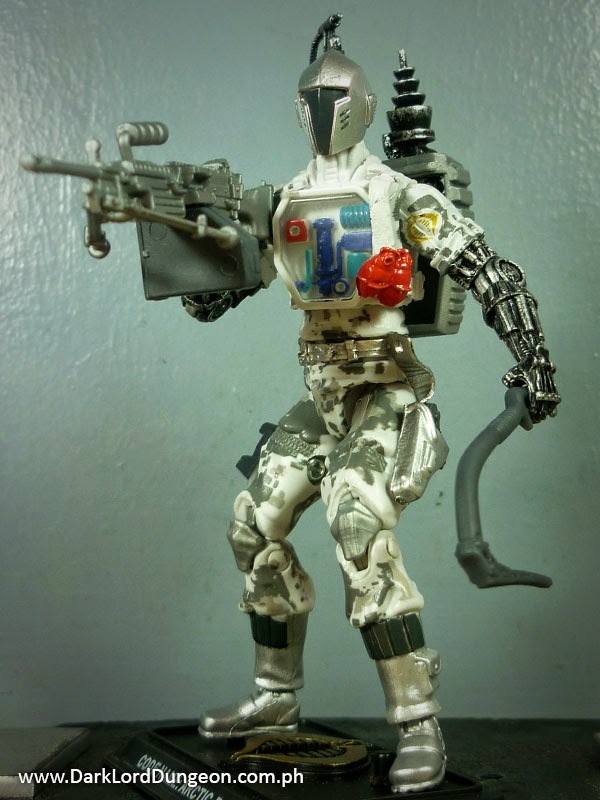 You just have to respect COBRA's unrelenting disposable trooper. Presenting the DX9 Armor Upgrade for the Evasion Mode Optimus Prime. To be more specific this is a DX9 Armor upgrade placed upon a Platinum Edition Evasion Mode Optimus Prime. We don't have the regular Hasbro version. We have the Takara version which you can check out in the Platinum Edition review, but somehow given all that chrome, the Armor Upgrade seemed best combined with something that had a lot of chrome as well. The upgrade also technically doesn't create an Optimus Prime. It creates a Transtector - an empty shell body of Optimus Prime that's being animated by a Human Power-Master - hence the red eyes instead of the baby-blue eyes of leadership - or a PowerMaster Optimus Prime at best. Presenting the Toy of the Year 2014 of the Dark Lord Dungeon. These two criteria answer which toys rule each month of the year. The final winner of Toy of the Year though goes to which among the 12 gave us the most joy. Previous winners include: The Cobra Iron Grenadier (2011); The Star Wars Republic Attack Dropship (2012), and; Springer (2013).